This stately home in North Derbyshire is the residence of the Duke and Duchess of Devonshire and has been a part of their family since 1549 when Bess of Hardwick settled there. It is the jewel in the crown of the surrounding parkland and overlooks the low-lying hills that separate the Wye and Derwent valleys. Chatsworth House boasts an impressive collection of art and other fineries, regarded as one of the largest and most important private collections in Britain. The highlights of this impressive feat of preservation include paintings by Rembrandt and Renoir, sculptures dating back to 150 BC and a stunning selection of jewellery. And for the literature lovers among you, the library holds works such as the Hours of Henry VII from c. 1485-1509 and John James Audubon’s The Birds of America. 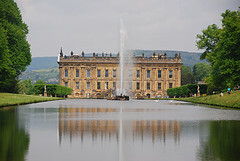 With over 30 rooms to admire, Chatsworth promises to be a fantastic day out. But it isn’t just the House that’s worth seeing. The 105 acres of gardens are perfect to explore whilst getting a breath of fresh air. Dating back over 450 years, the gardens are grand and mesmerising to say the least. See if you can find the 300 year old Cascade waterwork, the waterfall in the rockery and the famous Emperor Fountain. If the kids are still looking for a bit of adventure the Farmyard and adventure playground are ideal places for them to let off a bit of steam. They can meet the animals, ride in a trailer and clamber about on the rope bridges. And for when you really want to stretch your legs the grounds extend even further into the 1000 acre Park and Stand Wood. It is hardly surprising that Chatsworth House is so popular with visitors as you can spend an entire day indulging in the awesome grandeur that is the House and grounds. Opening Times: House 11am-5:30pm, Garden 11am-6pm, Farmyard and Adventure Playground 10:30am-5:30pm. Last Admissions 1 hour before closing.